Like us on Facebook to stay up to date on the latest sales, events and promotions taking place at Kristi's Pour House of Hart, MI. Just click the button below to be taken to our Facebook page! February 1, 2015 Super Bowl party. $1 domestic bottles noon-4 and food and drink specials all day. Come watch on our big screen tv's. Looking to have a great time with family or friends? No problem, stop into the Pour House and enjoy some amazing drinks and a great, comfortable and relaxing atmosphere. Our friendly and attentive staff will make sure your needs are met and that your time with us is memorable. It's always a great time here at the Pour House and we would love for you to join us. 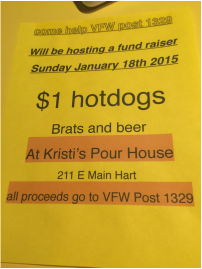 Welcome to Kristi's Pour House of Hart, MI. We are a full service bar and grill offering amazing food, great drinks and affordable prices. We are always having a great time here at the Pour House and would love for you to join us. Stop in today and see what we are all about! We look forward to serving you! We are conveniently located on E. Main St in Hart, MI. Our location makes us easy to get to no matter what your plans are. Our friendly and attentive staff is some of the best in the business and our sports, games and other events taking place at the Pour House will have you wishing you would never have to leave. Bring your family or friends out for a great time and we promise everyone will be raving about it!